Congenital hypothyroidism (CH) is a disorder characterized by thyroid hormone deficiency that is present at birth. A complete or partial loss of thyroid functions occurs in a newborn due to a myriad of reasons. This leads to disturbances in growth, metabolism and brain development. If left untreated, CH can give rise to abnormal growth and severe intellectual disability. CH is a rare disorder, occurring in almost 1 in every 3000 to 4000 individuals. Although the condition has been observed in all populations throughout the world, it is slightly more prevalent among the Hispanic group. Girls are twice as much affected by CH as boys. 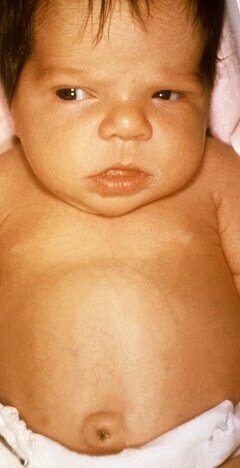 Most infants born with CH either have a thyroid gland that fails to develop properly or is missing altogether. In certain cases, the gland might be smaller in size than usual or not located in its proper place. In healthy individuals, the thyroid gland is placed at the center of the front part of the neck, close to the top of the windpipe. In some newborns having CH, the gland might instead be placed at the side of neck or under the tongue. An underdeveloped or misplaced thyroid gland often fails to work at their optimal level and produce less thyroid hormone than what is required by the body. In case the thyroid gland is absent, a baby cannot produce any of his or her own thyroid hormone. A misplaced (ectopic), underdeveloped (hypoplastic) or missing (athyreosis) thyroid gland is a type of birth defect that is caused by unknown factors and is generally not inherited. In some lesser known cases, CH develops due to inherited changes within a single gene or a pair of genes. Children with inherited type of congenital hypothyroidism do not make sufficient quantities of thyroid hormone in spite of the fact that their thyroid gland seems to be normal in shape and size. Around 15% of children born with CH are believed to have the inherited form of the disorder. The fetal thyroid gland fails to make sufficient amounts of thyroid hormone if the mother is having an iodine deficiency during her pregnancy. In such cases, the baby is born with congenital hypothyroidism. This is a major problem in certain areas of the world where the people fail to get enough quantities of iodine in their regular diet. However, CH in United States and other developed countries rarely occurs due to this factor as the table salt in these places is supplemented with iodine, i.e., iodized salt. Other foods such as dairy products also have sufficient quantities of iodine. In some rare cases, CH develops when a mother is treated with anti-thyroid drugs during her pregnancy to manage her own thyroid problems. Apart from the above mentioned causes, CH may also occur sporadically due to some idiopathic factors. Children who are left untreated generally become mentally retarded and have a much shorter height than average. 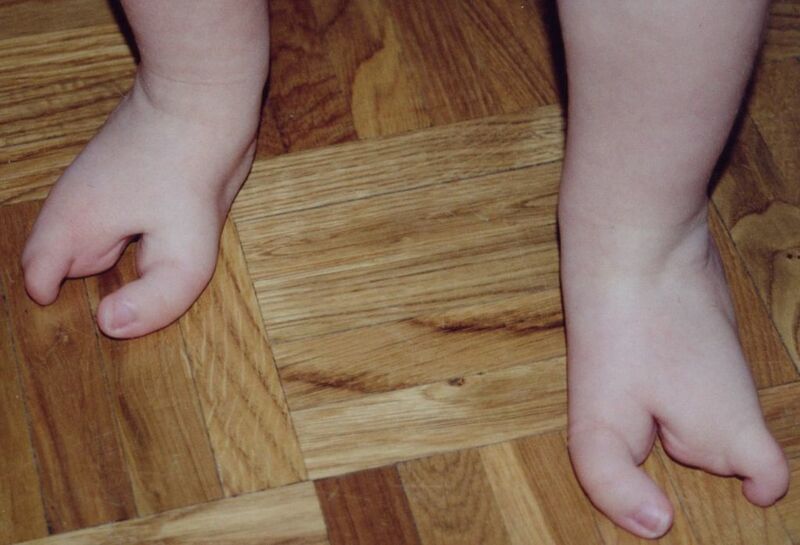 Spasticity and unsteady gait are also common features. Many have speech delays as well as some other behavior problems. Physicians should be well alert of the limitations associated with each of these methods. Primary measurement of TSH with backup T4 (thyroxine) assessment misses the delayed TSH elevation occurring in infants having TBG (thyroxine-binding globulin) deficiency, hypothyroxinemia or central hypothyroidism. Along with this, the normal postnatal increasing in the TSH levels can pose as an issue when the affected infants are discharged earlier. However, this particular method often misses hyperthyroxinemia in the infants having delayed TSH increase with initially normal T4. The best method of screening is the simultaneous approach, although this method is not yet feasible on a regular basis. Screening for CH should be performed on all infants between 2 and 4 days of birth. However, if this seems difficult, the testing should be conducted before being discharged or within 7 days of birth. False positive TSH elevations can be detected in specimens that are collected between 24 and 48 hours after birth. False negative results can be detected in seriously ill newborns or in the post-transfusion infants. Screening prior to the transfusion or discharge is ideally preferable to missing a diagnosis. Special attention should be given to infants kept under emergency care so as not to miss the screening. CH is usually treated with thyroid hormone replacement therapy. This is a safe procedure and is easy to take. If treatment is started immediately after a child is diagnosed, it can help to prevent most or all of the side effects of CH. If delay of treatment causes damage to the brain or central nervous system and the nerves, it is generally permanent and is not possible to be reversed. Suffering infants are treated with L-thyroxine, a synthetic variant of the thyroid hormone whose chemical structure is same as that which is produced by the thyroid gland. This can be administered as tablets to all the babies having CH. The dosage would be decided upon by a team of the doctors and endocrinologists. The amounts of the medication will be gradually increased as a child grows. L-thyroxine should be taken every day by a patient throughout life. These small tablets can be easily crushed and mixed into food or a small quantity of juice, formula or some other liquid. It is best not to dissolve the tablets into a glass or a full bottle of liquid as the baby may not be able to finish the entire bottle and thus not get the full dosage of medicine. The pills can be easily chewed and swallowed by young children. No approved liquid variant of thyroid hormone exists. Typically, L-thyroxine tablets should be administered at least 30 minutes before a particular meal or feeding. The dose range that is most commonly recommended is 10-15 μg/kg per day, usually 37.5 or 44 μg. The safest medication to treat CH is synthetic L-thyroxine. During the past, prior to the availability of synthetic forms, affected children were given dried thyroid hormone obtained from pooled animal tissues. This is known as dessicated thyroid and it is still available today. However, using dessicated thyroid is not advisable as the dose of the hormone present within it is not consistent. Dietary iodide supplementation administered in iodine-deficient areas can help to prevent endemic cretinism. However, it does not have any major effect on the management of sporadic CH. Children should be given iron supplements and soy-based formulas which can decrease the overall absorption of thyroid hormone from the L-thyroxine tablets. There should be at least a one hour gap between feeding the child iron supplements or soy formula and synthetic L-thyroxine pills. The doctor who is in charge of treatment should be notified that the baby is being fed iron supplements or soy formula, so that the medications can be adjusted or monitored if necessary. A child put under treatment with L-thyroxine should be regularly taken to the doctor for an overall checkup of his or her height, weight, development and general health. Regular blood tests should also be conducted to evaluate the levels of thyroid hormone. The blood tests are normally done every 1 to 3 months until the child is about 1 year old, and then every 2 to 4 months until about the age of 3. The frequency of blood tests can be reduced after the child reaches 3 years of age. The doctor might suggest an overall evaluation of the child’s development. If the child shows delays in some specific areas of speech or learning, it might be possible to arrange for additional help. Early intervention programs can be availed which are present in most developed countries to provide support to young children before they attain school age. Most infants born with CH who are treated correctly with thyroxine are likely to develop and grow normally in every respect. Even most patients with athyreosis as well as undetectable T4 (thyroxine) levels at birth have shown normal intelligence, although their general academic performance is slightly lower than that of their siblings and moderate to mild learning difficulties can be seen in some individuals. Despite treatment, infants diagnosed with CH by newborn screening generally do not fare as good as their euthyroid counterparts. Early treatment can help to minimize cognitive difficulties as well as avoid further complications associated with this disorder. CH is the most commonly preventable cause of intellectual disability and mental retardation. An early detection, followed by appropriate treatment, leads to a better outcome. Although dietary iodide supplementation helps to prevent cretinism and endemic goiter, it does not assist in protecting the child from sporadic CH. Long-acting intramuscular shots of iodized oil as well as oral lipiodol has also been proven effective to manage hypothyroidism in some areas. Mothers should not be treated with radioactive iodine or have iodine as an antiseptic. Various methods of prenatal screening and diagnosis are currently being evaluated. 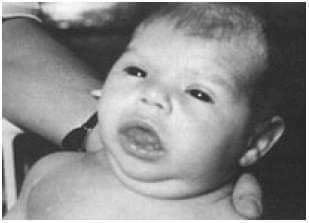 Here are some images showing the physical appearance of infants born with CH.